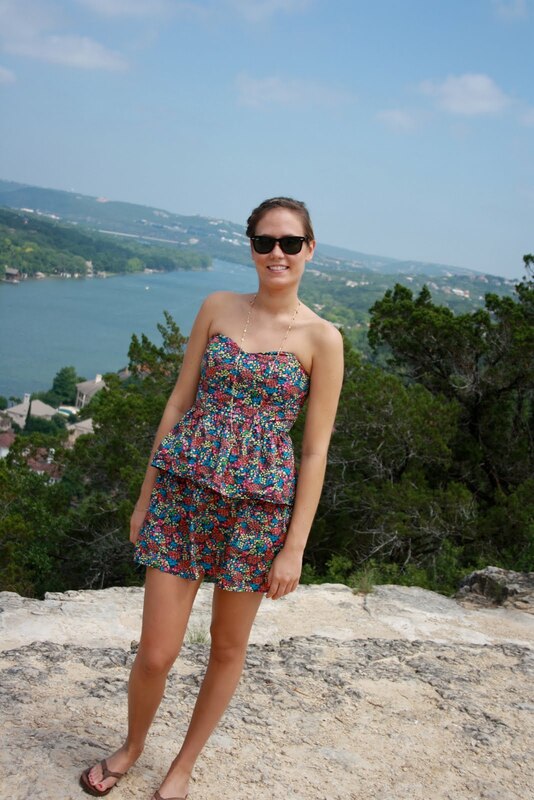 Fashion blogging is helping me streamline a lot of my clothes and the way I wear them. After Paisley another pattern I have discovered in my wardrobe is 'Polka-Dots'. 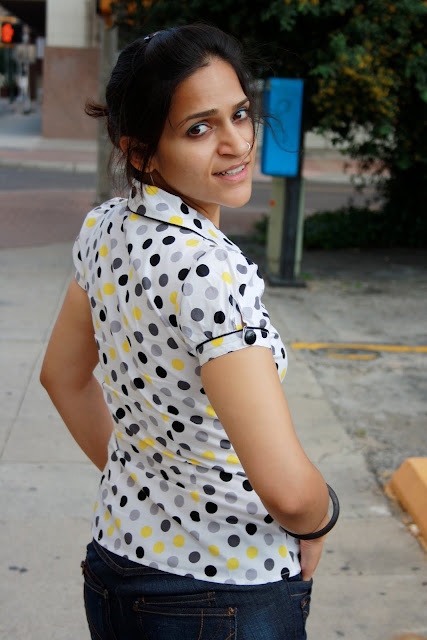 Lately, I feel I have to make an effort to not wear Polka Dots, I simply have too many of them in my summer clothing. Also, now I see it as a challenge to wear my existing clothes with a twist, than to go out there and buy new ones. I have been investing in a lot more accessories [and of course shoes!] than clothes. I say, it's a great bonus, besides the fact that I am thoroughly enjoying what I do! Was just going through your previous blog...and this one popped! And love your pics in this one...the polka dots look cute and refreshing...! Have a wondeful happeee week! P.S. Saw karate kid...really liked it, thanks! I love polka dots tooo! Why stop wearing something that's so lovely?? Keep the Polka's! Team it with floral accessories adds a funk to it! Love it. More than this I am loving the gray n white polka top on the side bar of your blog..gray is one of my fave colors! The denim shorts...totally my thing! Polka dots are here to stay! Why give them up? They are lovely!! Love the shoes! I love that you snapped a picture of someone else's shoes. I would do the exact same thing. I am also currently hunting for the perfect pair of toms to take with me on vacation. Thanks for the reminder. Love the top on you. Polka dots really are a great trend. I love Toms as well. I have a pair and they are so comfortable. Love the multiple colors of polka dots. Seriously great idea, I have so much stuff - I just need new accessories to spice it up! I didn't know you were in San Antonio! My aunt's family used to live there and the bbq was supposed to be great! I absolutely love the polka dots! Polka-Dots look amazing on u.Can give a break for few weeks. I love the 2nd pic. I'm a polka dot gal too! Lovin' your yellow sandals..and your mom is fabulous also! The slip ons are awesome. I'm hosting a giveaway at my blog. Check it out! Polka dots are so awesome though :) Very cute outfit! I also love polka dots! But I don't seem to have such a huge collection of them in my wardrobe! 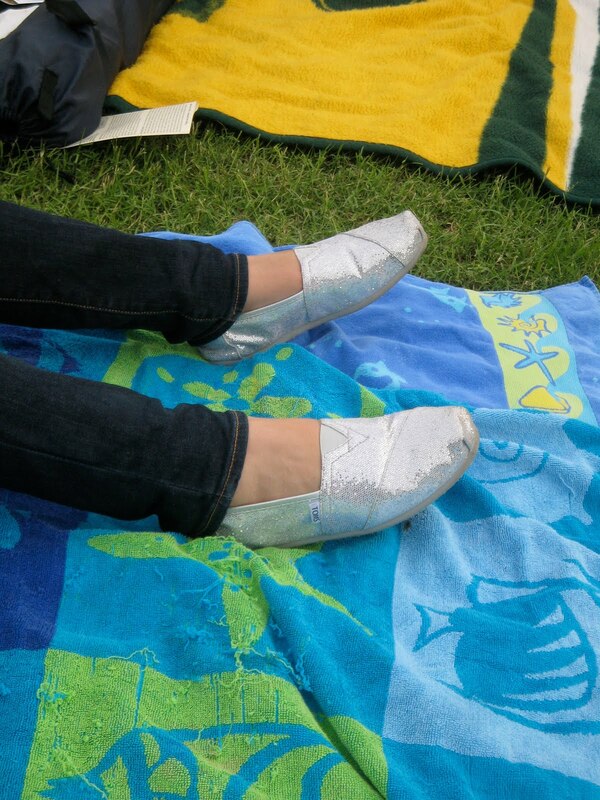 I also love those sparkly TOMs!! Thay are so incredibly fantastic. I have mad shoe envy right now. lovely lovely polka dots & surely digging the shoes.